We're on a summer break at the moment. We're spread across the country – some of us doing the Ed. Fringe with other shows, some of us just taking a well deserved break. We'll be back with more news in the Autumn, with our exciting line-up of Autumn-Winter gigs. Yes it's the only cabaret that's (almost) all made up on the spot! Settle down at one of our intimate tables, with a glass of something cold & enjoy a night of delicious FREE fun & laugher. This Thursday 20 March you can see a veritable smorgasbord of cabaret and musical improv delights. 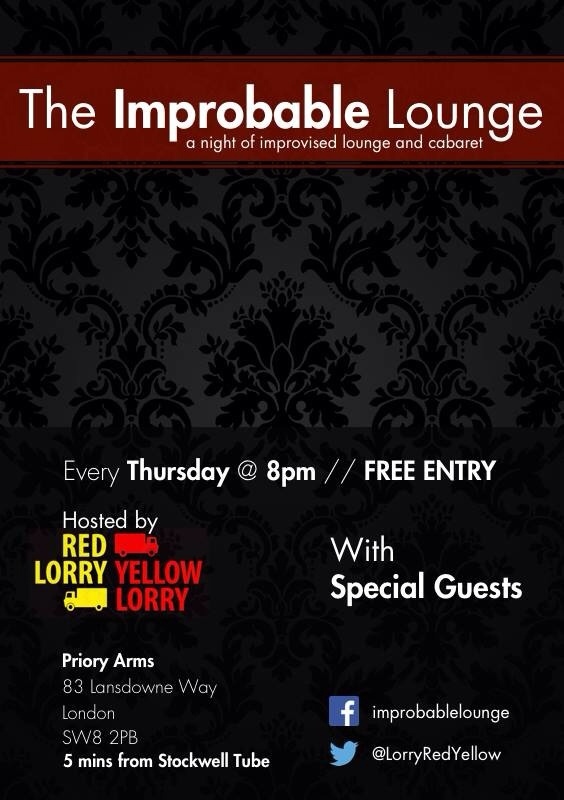 All for free at our weekly residential Improbable Lounge! ~~ Laurie Black – musical comedy on uke, keyboards & Accordion! 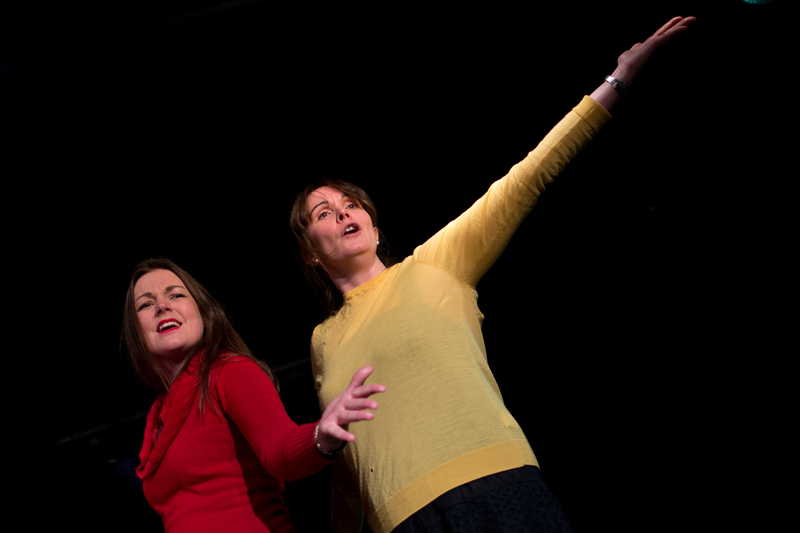 Plus musical comedy improv cabaret from US, your hosts, Red Lorry Yellow Lorry…. But don't take our word for it – make your own mind up by reading the words and wisdom of our fabbest ukelele songstress Laurie Black. See Laurie for FREE by getting on down to the Improbable Lounge on Thursday! Improv/creative outlet: Anything musical I can get my hands on – keyboards, ukuleles & accordions mainly. I sing a bit too. 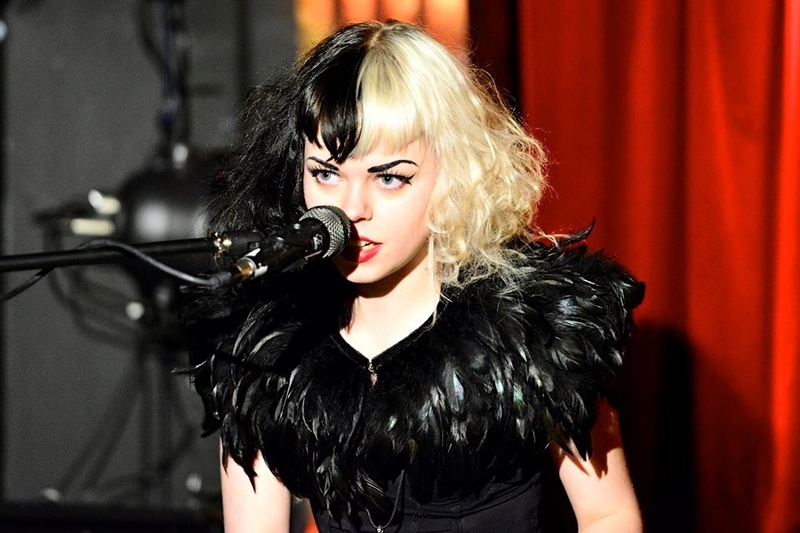 Tell us about your act in a nutshell: A black n white haired banshee singing funny songs. Musical comedy philosophy: Either they're laughing at your jokes or they're laughing at you being crap and having crap jokes – either way, they're laughing! Best musical moment: Playing piano for Joe Black – possibly a distant cousin of mine – in Windsor last year. We rocked some Tom Waits and, of course, Cruella. That was my first big step into the world of cabaret and musical comedy. What makes you happy: I'm a metalhead at heart, so getting the chance to go wild at a metal gig makes me happy & is good for my bones. But great musical comedy, improv and being surrounded by wonderful performers makes me equally as happy – I definitely feel that when I play Improbable Lounge with Red Lorry Yellow Lorry. We have musical comedy, musical improv & cabaret. Plus lovely beer, cosy tables and the nicest audience in town,..
Hello all London improvisors & comedians … We're inviting you to our MUSICAL IMPROV COMEDY JAM and social. Love improv? Want to try out musicial improv? Want to meet other Improvisors? Come on down…. Sign up on the door to take part in our musical comedy improv jam. Experienced, beginners or terrified 'never done it befores' all welcome. Our wonderful pianist Tom Hodge will be accompanying you. It will be a glorious smorgasbord of unabashed musical improv delights and merriment. Plus fabulous improv and cabaret entertainment from our special guests All Made Up (all female improv troupe); Marc Steele (ukelele songster) and Mynxie Monroe (alternative burlesque). We will end the night with a friendly social where you can chat to other Improvisors and make new contacts. The priory arms has lovely real ale, friendly staff and good priced food too. We really want to meet you! So come on down! 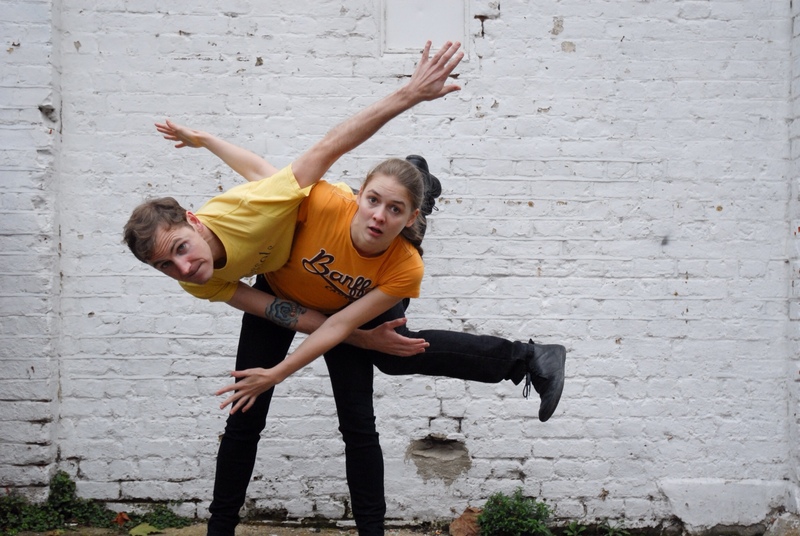 We catch up with the make shift crew, ahead of their improv appearance at the Improbable Lounge on Thursday 20 feb. Come and see them and our other great acts – upstairs at the Priory Arms, Lansdowne Way, Stockwell. Show starts 8pm and it's free entry! Tell us about Make Shift in a nutshell: make shift was born in a Chicago fever dream, and owes a lot to that 'Chicago style', playing a long-form piece made up of interlocking stories/character studies. As a duo we really focus on letting our characters breathe, becoming alive so we want to see them later. Apart from improv, what other hats do you wear: Alex is a psychologist who works with organisations to improve their capabilities and keep them mentally healthy, and also a science writer for the British Psychological Society. Julia is a daydreamer and enthusiastic aunt and big sister and thinks she's going to write a book one day. Improv philosophy: See who wants to come out to play! Alex: something from the Cellblock 26-hour improvised soap. As liberation psychologist Jacques Dedàle, having a tender tête à tête with Jon Monkhouse's inmate Dai Llewellyn and semi-adopting him under the nose of his disapproving and increasingly irate ghost father (Jules Munns). We later end up as a couple – but give us a break, it was 24 hours of show later. Julia: At the Loose Moose theatre in Calgary Canada: in the middle of a trance mask session, jumping head-first into the hole cut into the prop bed and getting stuck with legs sticking out. and for Julia it’s Wachsmaske, Messwechsel, Messwechsel, Wachsmaske – 3 times, but faster! Oh my – we had such fun at the Improbable Lounge on Thursday 6 February. 1. Jacky Wood, comedy songstress extraordinaire, taught us that geeky partners will end up with an Angry Bird all of their own if they don't get out of the ipad and pay their girlfriend some attention. 3. The audience taught us that even a tube strike can't stand in the way of a good time, and one of them bought all the performers shots! Lovely lovely man. Plus we learnt that every Thursday at 8pm you can have more fun and laughter than is clinically good for you at the wonderful Improbable Lounge, at the priory arms in Stockwell. And it's FREE! Thursday, January 30th is a night of delicious FREE musical comedy, improv & cabaret. Including our soon-to-be-infamous MUSICAL IMPROV COMEDY JAM and MUSICAL COMEDY OPEN SPOT. Sign up on the door to take part in our improv jam or do an open spot. Or just sit back and enjoy the show. Experienced, beginners or terrified 'never done it befores' all welcome. Our wonderful pianist Tom Hodge will be accompanying you, plus there will be musical comedy improv from your hosts, Red Lorry Yellow Lorry, to ease you through the night. On Thursday 16 January we have the delightful Viv Groskop joining us at the Improbable Lounge, performing musical comedy. 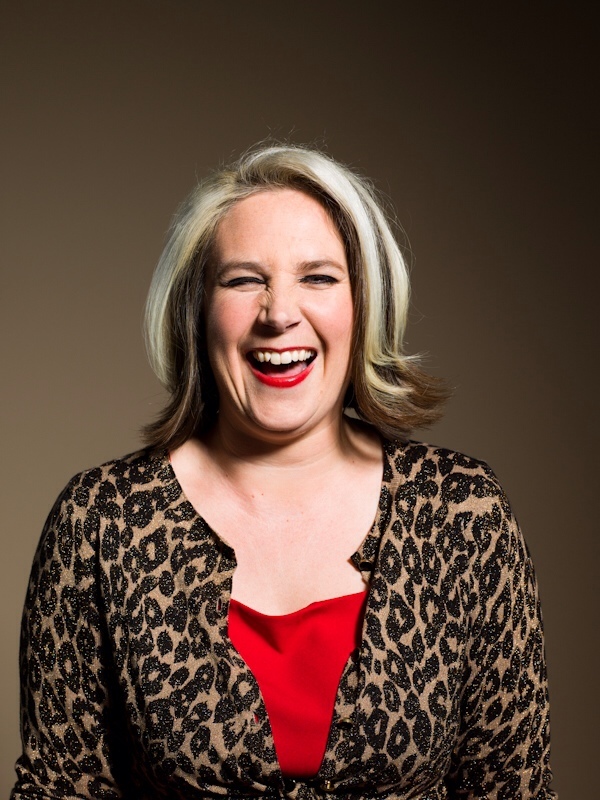 Here is Viv's take on life, laughter and improv…in the latest in our series of '5 minute with' interviews…best enjoyed with a nice cup of tea and a Mr Kiplings. Tell us about your act in a nutshell: My sister-in-law once described it to someone as “just Viv talking, really.” Elsewhere I have been described as a “charming oddball.” It's supposed to be observational stand-up, I think. Improv philosophy: Listen. Listen. Listen. Listen. Listen. Listen. Now breathe. Best improv moment: Being called upon to portray a fluent Japanese speaker and displaying this by saying “chicken teriyaki”. What makes you happy: Realising that I am near the end of a set or a show and that it *is* actually near the end of the set or the show. As opposed to thinking “I am near the end” and realising there are 20 minutes left and I have nothing. And finally…your favourite tongue twister: I like it when French people make you say “grenier” (barn) or “grenouille” (frog) because they think you will say it like a total idiot. But really they are not so hard to say, you French fools. We have some great acts performing with us in January. All welcome to come and perform on the night. Just turn up and put your name in the top hat. From experienced improvisers to timid first timers – this is your night!